RALEIGH — The likelihood of a challenge to newly drawn maps continues to build as the N.C. General Assembly prepares to formally submit them to federal court in Greensboro. The General Assembly has approved this new map for N.C. Senate districts in Western North Carolina. Federal judges will have to sign off on it and it will likely face additional legal challenges. 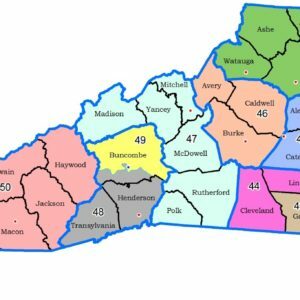 Legislative leaders have until the end of the week to submit the new legislative districts approved last week to a three-judge panel in the Greensboro. 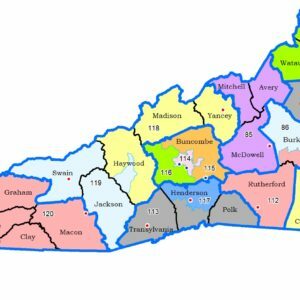 The General Assembly was under a court order to approve new House and Senate districts by Sept. 1, following a Supreme Court decision in June that upheld the lower court’s ruling that 19 House and nine Senate districts were the result of unconstitutional racial gerrymandering. Plaintiffs in the case have until Sept. 15 to submit their response, but an alternative plan and an analysis released during recent legislative hearings indicates a host of concerns about the new district lines and the way they were constructed. A spokesman for the Southern Coalition for Social Justice, lead counsel for the plaintiffs, declined to spell out specific challenges for now, but pointed to the documents as a guide to some of the key issues with the maps. Bob Phillips, executive director of Common Cause of North Carolina, said he believe the plaintiffs have already made a strong argument that the new maps should be thrown out. The courts, he said, is likely to agree. “I’m not convinced that what the lawmakers have offered up is going to pass the smell test with the court,” Phillips said in a recent interview with Carolina Public Press. Phillips said there appears to be a strong case that the new plans constitute both racial gerrymandering and a violation of the state constitution’s prohibition on redrawing districts mid-decade. “There are some things you cannot do,” he said. “Some of the districts that are changed are not the 28 found in violation or those that are aligned to them,” he said. Phillips said the maps could also see a challenge on the grounds of partisan gerrymandering, an assertion he says was bolstered last week by a ruling in a federal court allowing Common Cause’s challenge of North Carolina’s congressional maps over partisan gerrymandering to go forward. The N.C. General Assembly has approved this N.C. House district map for Western North Carolina. It will have to face federal judicial review and possible legal challenges. Phillips said he was disappointed to see the legislature go the “same old route” of relying heavily on political considerations in drawing the maps. As a result, he said, the court may not give the legislature another chance. During its late July hearing in Greensboro, the three-judge panel discussed the prospect of appointing a special master to draw the new maps, the same route taken in a recent federal redistricting case in Virginia. Like the maps in 2011 they were required to replace, the new districts appear to heavily favor GOP candidates. In the week-long redistricting session they passed through committees and both chambers largely along party lines. There were some defections to the partisan votes, particularly among GOP incumbents either drawn out of their districts or double-bunked with fellow Republicans. The new maps did accomplish the goal of tightening up districts. Districts are far more compact overall and the number of divided municipalities and split precincts are sharply reduced. Despite the changes, the redrawn districts do not portend a major shift in the legislature, where there are 74 Republicans and 46 Democrats in the House and 35 Republicans and 15 Democrats in the Senate. Although, estimates based on past election results show a larger number of competitive districts, the GOP would still maintain significant majorities in both chambers under the new maps. But the changes could spell an end to the GOP’s long run of super-majorities in one or both chambers. Democrats would have to flip six seats in the Senate and three in the House to take away the GOP’s veto-proof margin. Most of the state’s western region was left unchanged since nearly all of the 28 unconstitutional districts were located around Charlotte, Winston-Salem, Greensboro, Raleigh and Fayetteville. Altering areas well outside of those districts named in the court decision would have likely drawn a new legal challenge and in the case of the one WNC district altered still might. The new maps put incumbent GOP senators Deanna Ballard of Blowing Rock and Shirley Randleman in a new district made up of Ashe, Alleghany, Surry, Watauga and Wilkes counties. Ballard ultimately joined the dissenters, voting against the Senate plan. She was joined in opposition when the Senate bill crossed over to the House. During floor debate, Rep. Jonathan Jordan, R-Ashe, said he could not support the Senate plan. The court would likely question some of the districts, he said, but his main objection was the effect of the new county grouping in WNC. “Eventually, my area of northwestern North Carolina, is going to lose a Senate representative,” he said. Ballard has not commented on the maps yet, but a spokesman said he expect her to make a statement this week. During both last week’s final debate and the series of committee meetings and public hearing leading up to it, the divide over the process and who controls it dominated discussion. Phillips and other voting rights advocates repeatedly called for an independent redistricting effort to get the state beyond what has been decades of legal and legislative battle over map-making. Throughout the week-long session Senate and House leadership pushed back hard against the idea, asserting that the state constitution gives the legislature alone the authority to redistrict. 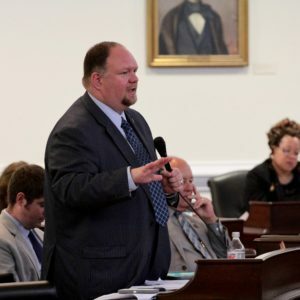 “I don’t believe in unicorns, fairies and bipartisan commissions,” Senate redistricting chair Ralph Hise, R-Mitchell, quipped at one point during a hearing. In a hard hitting closing argument, Senate leader Phil Berger, R-Rockingham, said Democrats’ charges of unfairness masked their growing disconnection with voters in much of the state. Sen. Dan Blue, D-Wake, the Senate Minority Leader and a veteran of several redistricting cycles, said afterward that despite the intensity of the defense, the new maps have serious flaws. Blue said he also believes the court could take over the process. Catawba College professor of political science Michael Bitzer said ultimately, the issues in North Carolina are going to be be heavily influenced by what happens in an upcoming U.S. Supreme Court aimed at settling the question on whether partisan gerrymandering is unconstitutional. Bitzer said he thinks the new maps could face a challenge on those grounds.